How To Dye Easter Eggs: Coloring Easter Eggs Made Simple! Coloring Easter Eggs Made Simple! food coloring or Easter-egg dye (tablets, sachets, or Easter egg dyeing kits). Different parts of the world have different Easter egg dyes on offer. Some liquid food dyes are perfect for dyeing Easter eggs: You just mix half a glass of water with one or two tablespoons of white vinegar, then add 20 or so drops of dye, and you have the perfect dye vat. Another option would be a dedicated egg coloring kit. It tells you exactly how to dye Easter eggs, and you have the assurance that it will do the job. I didn't buy one, though, because they all contained additional gizmos that I didn't want (like plastic cups, stamps or stickers). What I really wanted were the egg coloring tablets I had always used at home in Germany, perfectly reliable and 100% food safe. But no one seemed to be selling them in the UK! Both kinds dye well, but the results look strikingly different. The eggs in the photo above were all dyed in one session, with the same set of colors. Because Easter egg dyes are like watercolors (not opaque), the brown eggshell colors shine through and give the eggs a mellow, warm, slightly desaturated look. If you're wondering how to dye Easter eggs with a Mid-century or 'vintage' flair: Brown eggs will do that for you. The color schemes look glorious - check out this Easter table and this one, too. I had heard that duck eggs are notoriously hard to dye, so I tried dyeing them right after boiling, when they were still piping hot. It worked a treat - and they dried off so fast afterwards, with a beautiful velvety finish! The ultimate Easter egg drying rack: a grid of pins in corrugated cardboard. Protect your worktop from dye stains with a thick padding of newspaper. Before preparing the dyes, create a drying rack. Some people use foam board for this, but why waste your money? A double layer of recycled, corrugated cardboard is really all you need. Blow out or boil the eggs you're going to dye. Make sure they are perfectly clean and don't have cracks where the dye can seep in. Prepare your dyes as per the instructions on the packet. If at all possible, use cups/mugs/glasses that allow you to submerge the entire egg in the dye. It makes life so much easier! 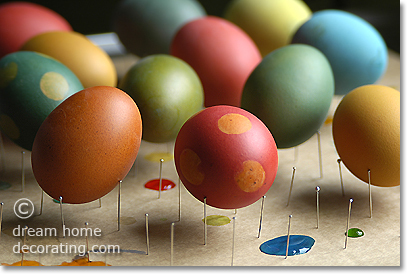 make perfect Easter egg dye vats. Once the egg's in the dye, gently move it around, say every 15-30 seconds, for an even coat. (I keep a tablespoon in each cup for that purpose.) You also want to avoid air bubbles gathering on the eggshell, because they can interfere with the absorption of dye into the shell. You can double, triple, quadruple the hues you get from each dye color, but you don't need a separate dye vat for each hue. All you have to do is transfer the eggs between dye vats (using a tablespoon) to mix a subtly different hue for each egg. More info about color mixing here! At home, our Mom used to give us a chunk of bacon rind that would just fit into our little paws, and then we'd put some shine on our freshly dyed Easter eggs. These days, I rub my hands with a small amount of olive oil and then gently 'polish' each egg. Excess oil comes off easily with kitchen paper. Return from How To Dye Easter Eggs to Easter Craft Ideas.